"First comes the day Then comes the night. After the darkness Shines through the light. The difference, they say, Is only made right By the resolving of gray Through refined Jedi sight." Who better to resolve the gray than man's best friend, your most loyal knee-high companion—that cuddly ball of fur Sith Lords would sooner snuggle with than suspect of colluding with the Rebel Alliance? Who better to lead the Jedi Order, that panel of the wisest beings to ever exist in the galaxy? It's probably your pup! Naturally, of those members of the Order, Yoda is considered the most loyal. He's always there to help out his fellow Jedi, except for when he's vacationing on Dagobah, so we just know your loyal best friend is itching to play the part. In this adorable Star Wars pet costume, that little doggo can finally do just that! 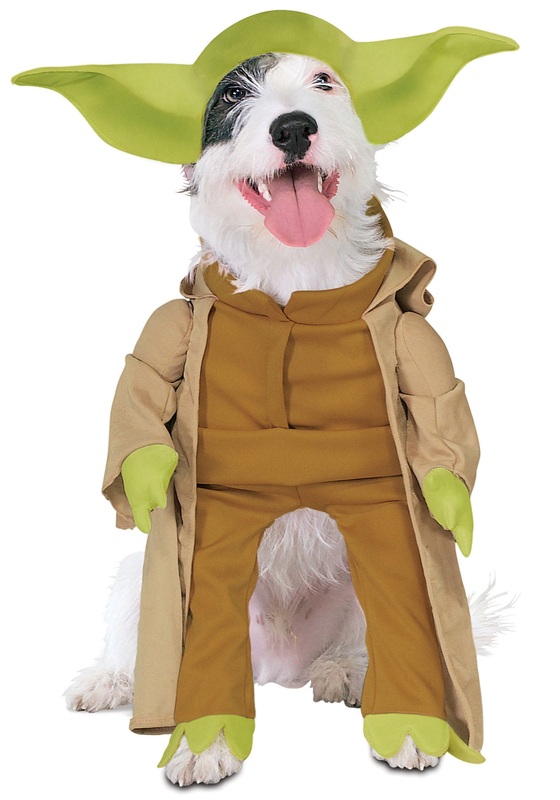 It comes with a Yoda body piece that ties around the neck and a matching, large headpiece to emulate those iconic ears. Better yet, it's 100% Polyester, so this costume won't be getting scratched off. We can all but guarantee this pet get-up will be a hit! That said, we cannot, however, guarantee it will help you lift that X-Wing out of that swamp.